I'm one and as I've been explicit about it, this is now mutual knowledge. The Royal Society of the Arts have a fun Pinker video. Ten minutes, well spent. Is ancient philosophy ancient history? Responding to an argument that ancient Greek philosophy is not long for this world, philosopher John Pepple has a slightly more upbeat take on the issue. Interesting and well worth the read. I have an article today on Comment is Free at the Guardian on the strange case of Martin Gaskell, a devout Christian, who was rejected for an astronomy post at the University of Kentucky. The reasons for his rejection appear to have been based on his religion and he won $125,000 in an out-of-court settlement as a result. Many of new atheist persuasion seem to feel rather let down by the University settling the case. The comments on my piece give an indication of the diversity of opinion on this matter. OK, it's not exactly hot off the press, but an article in the Journal of Roman Studies 94 (2004) 73 - 121, Reconstructing the Serapeum in Alexandria from Archaeological Evidence by Judith McKenzie et al, is certainly of interest to Alexandrian Library watchers. As we know, the persistent story that Christians destroyed the Great Library of Alexandria comes from Edward Gibbon's Decline and Fall of the Roman Empire. He mistakenly assumed that there was a library in the Serapeum when it was destroyed by a Christian mob in 391AD. There was once a library there, but it had disappeared before the mob arrived, so it is not mentioned in any of the various accounts of the destruction. The earliest mention of the Serapeum library is a comment by Tertullian in 197AD (chapter 18 of his Apology) that the copies of the Septuagint can be found there. It is often assumed that this library had been founded by Ptolemy II in the third century BC but this is not explicitly stated in any source until after 1000AD. So, what light can the archaeology of the Serapeum shed on the question? The first point to note is that two temples were built on the site. The first was constructed by Ptolemy III and is securely dated to his reign by dedicatory inscriptions. This burnt down in 181AD in what seems to have been an accidental fire. The new Roman foundation was much larger and was complete by 217AD. To me, it looks likely that the library dates from this period and was a new addition to the rebuilt and expanded temple. We know from later literary sources that it was not housed in the inner temple, but in the colonnades that surrounded it. Under the temple, passages have been found that contain niches. It has been romantically suggested that these niches might once have been used to store scrolls from the library, most recently by Richard Miles in his, otherwise excellent, TV show Ancient Worlds. In fact, these niches appear to be part of a mausoleum, perhaps for mummified animals. In other locations, similar niches have been found to contain animal bones. Of the destruction of the Serapeum in 391AD, archaeology confirms that it was only the temple within the precinct that was razed. The great colonnade remained standing for another 700 years before it was dismantled by Saladin to prove masonry to defend the city from crusaders. Thus, while the archaeology does not tell us what actually happened to the library, it does nothing to contradict the conclusion that it was not destroyed in 391AD as Edward Gibbon had supposed. Durbach N. "They might as well brand us: Working class resistance to compulsory vaccination in Victorian England." The Society for the Social History of Medicine. 2000; 13:45-62. Now I'm in the final throes of my PhD and so don't have the time to follow-up on this reference. If anyone else does, I'd be fascinated to hear the evidence that Durbach offers. I should point out that I'm not particularly skeptical that this happened, since one can find "local clergy" who advocate just about any position. It seems odd, however, since 1) the New Testament specifically states that no animal is "unclean"; and 2) the smallpox vaccine came from cowpox, which in turn came from ... wait for it ... cows. Cows are considered "clean" animals in the Old Testament. So it's difficult to see how the smallpox vaccine could be considered "unchristian" or even "unjewish". Readers will be saddened to hear of the death of Professor Ernan McMullin last weekend. I met him only once, at Cambridge last year, where he roundly criticised the continuity thesis (against the scientific revolution) I had put forward at the conference we were both speaking at. His work on Galileo is of the first importance and he was a lovely man even when he disagreed with you. Michael Ruse has written an appreciation which is well worth a look. Richard Carrier is without doubt a courageous and relentlessly revisionist historian and his ideas are often interesting and provocative. Back in 2002 he argued in Free-thought Today that Adolf Hitler was ‘unmistakably a God fearing Christian’  . Elsewhere he has claimed that the Ancient Greeks were on the brink of a scientific revolution before the 3rd century crisis erupted and that medieval intellectual culture achieved nothing of note in Science until the revival of pagan ‘scientific values’ during the Renaissance. His forthcoming book will argue that Jesus probably never existed based on the application of Bayesian probability theory to history . Now Richard has looked at the evidence for widespread watermills in Domesday England and concluded that the claims made by historians are factually dubious. Scholars of the Domesday book have claimed that all the mills listed within it’s pages (as 'molendinum' or 'molendini' or sometimes just 'mol') are all watermills and that there were something in the region of between 5,624 (Margaret Hodgen’s ‘Domesday Water Mills’ Antiquity 13 1939, p. 261-79) and 6,082 of them (H.C Darby’s ‘Domesday England’, p. 361). Most taxed mills would have been donkey, ox, or man driven, not hand mills (or watermills). 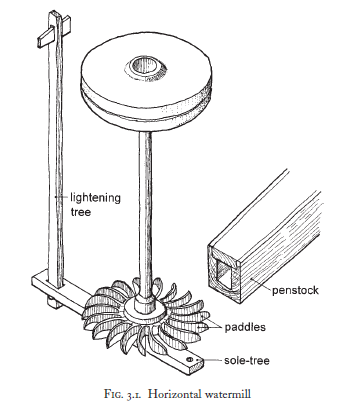 In other words, most mills had long been capstan mills (since Roman times at least). This is basic economic history. Saying no one in England had a capstan mill is like saying no one in America owns a truck. Donkeys weren't taxed so far as I know (and if they were, they would not be taxed separately by job), and if driven by oxen (or horses) they would come from the standing stock of the manor, not singled out. 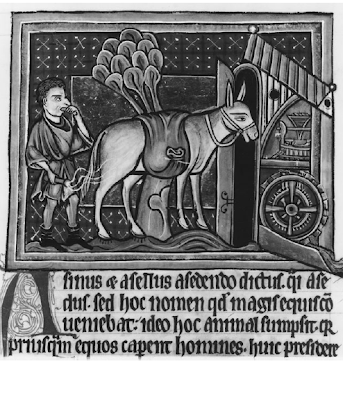 So unless a manor has zero oxen and horses in its entire holdings, you can't reference which animals would have been doing which jobs (much less when) just from tax filings, and even if there were no oxen or horses, there would be donkeys, and of course a capstan mill can be and often was driven by people. Indeed, the undeniable widespread fact of capstan mills guarantees that they aren't being distinguished in the tax documents. As if the entire continent somehow forgot the existence of the most common bulk milling machine ever invented and had no capstan mills anywhere! That's why the numbers cannot refer to watermills, but to bulk millstones (period), regardless of motive source. So we have no reliable measure of how many watermills there were (and there definitely were not that many--because most of those numbers had to be capstan mills)…. And it is a scandal that these numbers for "mola" (millstones) are constantly being conflated as numbers of "watermills." This really needs to stop. Why does any of this matter ?. Well if Carrier is right then numerous scholars – including the likes of Lynn White Jr, Reginald Lennard and W H G Armitage have cited an erroneous figure, one which has been used to justify the thesis that watermills were widespread throughout Anglo-Saxon England and that this represented a ‘far reaching cultural and technological change’. Accordingly I got in contact via email with three of the leading experts on Ancient and Medieval milling; John Langdon, Professor in the Faculty of history and Classics at the University of Alberta and author of ‘Mills in the Medieval Economy 1300-1540’; Dr Adam Lucas of the Science and Technology Studies program at the University of Wollongong and author of ‘Wind Water, Work – ancient and Medieval Milling Technology’; and Richard Holt, Professor of History at the University of Tromso in Norway and author of ‘The Mills of Medieval England’. All of these cite the figure of 6,000 watermills in their writings on the subject and I decided to present them with Richard’s argument to see whether they would stand by their use of the figure and whether there would be any revision of the field. Let’s look at the reasons for believing that all the mills mentioned in the Domesday Book are Watermills and not animal mills, windmills or hand mills as has been argued. The mills do not correspond to the more or less urban conglomerations of 11th century population as one might expect if they were animal mills for reasons I will explain shortly. Instead they are located in smaller rural communities and the headwaters of smaller watercourses. This becomes much clearer if you look at the regional surveys which were conducted by the historian H. C Darby and his team. 2) Californication – What are the Winter Mills ? When referring to the winter mills that appear to operate intermittently, Carrier writes ‘water [in England] would be low in winter, not high, so a watermill would only operate on a seasonal waterway in spring or summer, not winter’. 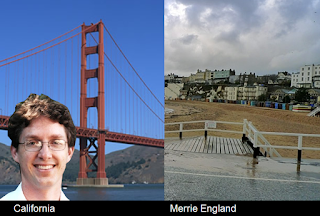 Unfortunately here, Carrier is projecting the Californian climate onto England. As anyone who hails from the UK knows the winters are usually cool, wet and windy and miserable with plentiful precipitation – so much so that flooding is quite frequent. This is certainly the case today and would have been the case in the 11th century. By contrast, in California, heavy snows accumulate in the Sierra Nevada which create an annual reserve of water – this is then released in the spring and summer adding meltwater to the rain fed streamflow. To be fair – according to Richard Holt, Carrier is far from the first American to think Anglo-Saxon England had an identical climate to the United States. Another historian – Kealey argued that the streams in England would have been frozen in winter and therefore some of the alleged watermills were really windmills (he was from New England – the arctic wilderness I currently live in) It seems likely therefore that HC Darby was right and that the intermittent mills are in fact watermills that can only work when winter arrives and there is enough water in streams. Carrier writes of HC Darby’s method -' The assumption is often made that when a mill’s tax is paid in eels, this indicates a watermill (as eels could be captured in its race), by which logic the number of watermills is claimed to have been close to 5,000, but since taxes are paid in eels even in towns without any mills at all, that assumption is clearly wrong. Eels just indicate a nearby stream or river. As John Langdon has pointed out, here Richard Carrier misrepresents Darby’s method. ‘In truth Darby only noted that many of the ‘mills’ (molendina or molina) had their valuations sometimes expressed in numbers of eels (e.g., Domesday England, p. 270)'. Actually – as we saw in the ‘geographical spread’ section H C Darby spent much of his career with his team authoring multiple volumes of regional Domesday surveys. These specifically note where mills do not pay renders of eels – some render honey, salt, malt rye and grain. 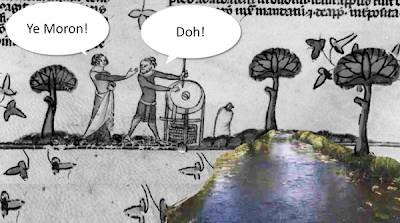 Is a partial rent of eels evidence for a watermill? Not conclusive but I think an objective observer would have to agree it’s pretty good evidence – especially when viewed as part of a cumulative case. Another guide for example is that the value of many of the mills given in the Domesday Book are high, showing them as obviously powerful. As Richard Holt pointed out in his response to my email, ‘we have no reference to animal mills before the 12th century (and just one possible example of archaeological evidence at Cheddar)’. By contrast we have lots of evidence to watermills from the 8th century onwards. According to H C Darby (Domesday England p270) ‘the earliest reference to a water-mill in England comes from a document referring to Chart in Kent and dating from 762. References to watermills becomes relatively numerous after about 800 or so’. ‘Manorial records are starting up in the 1120s, actually (Peterborough, Burton), and then it's a cascade after 1200. All the evidence then is for watermills (plus the new windmills after c.1185). Where one does comparisons with Domesday (I did it for Peterborough, Glastonbury, Ramsey, Ely, etc.) there is a clear correlation with DB - i.e., the watermills of 1125 /1189 /1221 etc. (proved to be watermills by contemporary accounts that detail repairs to water systems, etc) are in the same numbers on the same manors etc. as in 1086. One can trace an estate's mills through from 1086 to the 14th /15th century in lots of cases. Oh, and the manorial accounts, even the earliest, detail repairs to existing water systems and mills, not to new ones. So one can push the estate documentation back even further. But they DON'T detail work on animal mills, or mention rents from them'. Related to this point, later evidence relating to milling in England comes from the hundred rolls of the late 1270s and (as noted above) from detailed estate surveys. 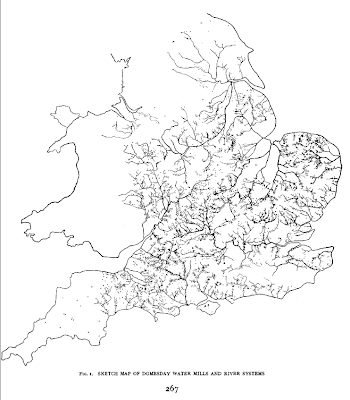 Using this evidence Richard Holt in ‘The Mills of Medieval England’ and - focusing on the West Midlands - John Langdon in his article ‘Watermills and Windmills in the West Midlands’, used this data to calculate the number of watermills around 1300 as around 15,000. If the Domesday figure from 200 years earlier is wrong then this estimate looks decidedly odd. This is similar to what John Langdon states in ‘Mills in the Medieval Economy’ p125. According to him animal mills were useful for Lords in urban situations particularly when water power was not accessible. As Langdon argues on page 24 they are underrepresented in – for example manorial records – as they were more often attached to peasant holdings or subsumed in particular industries such as brewing. They were capable of filling a gap in milling in towns and cities where sources of energy were very stretched. 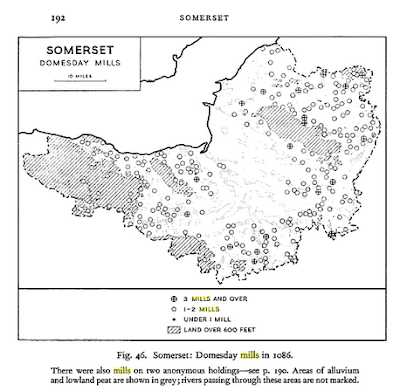 This being the case, if they were the mills shown in the Domesday book we would expect them to be located in urban areas.......which, as we saw earlier, they aren’t. 5) What about hand mills and windmills? Assuming the figure given by Hodgson hasn’t been revised by later research 6,000 handmills in a population of 1.4 million is quite clearly laughably low. Furthermore according to John Langdon in ‘Mills in the Medieval Economy’ (p24) handmills were not usually included at all in most records ‘since they were not considered to be sufficiently important to act as commercial enterprises, as watermills, windmills and (occasionally) horse-mills were’. However, despite being overshadowed Langdon speculates that they may have accounted for as much as 20% of grain milled in 1300. Windmills specifically driven by wind first appear in Europe in documents dating from the 1180s. According to Darby (Domesday England p270) ‘the first mention of a windmill does not appear until 1191 in a document relating to the Abbey of Bury St Edmunds’. So it is safe to say the mills in Domesday are not Windmills either. While John Langdon categorically rejected Carrier’s insights, he did agree that the area could do with some rethinking. For example ‘multiple mills on a manor may have been referring to sets of millstones on a manor rather than to separate water mill sites - that is, a single mill site on a river might have operated two or more sets of millstones’. This means that the final count is something of a conjecture. Nethertheless Langdon thinks that Darby’s estimate of 6,082 watermills is the more authoritative yet especially when you consider that many mills to the far north were not reported in the Domesday survey. Overall the experts I consulted concluded that – whilst the evidence isn’t conclusive – you can safely say beyond reasonable doubt that the Domesday mills are in fact watermills. If Carrier wants to argue against decades of scholarship and dozens of historians and archaeologists then he needs to bring more to the table. For my part there is something humorous about the Anglo-Saxon England Carrier has concocted – one in which toothless, god fearing peasants run expensive and underpowered capstan mills for their milling while standing mere yards away from abundant fast flowing rivers. Must have been quite the ‘doh’ moment when they finally figured it out. His skepticism arises from the fact that 'P(H/B) = as low as .51 or as high as 0.70 P(~H/B) = as high as 0.49 or as low as 0.30 P(E/H&B) = as low as 0.20 (model A) or as high as 0.80 (model B) P(E/~H&B) = as low as either 0.15 or 0.19 (on model A) or as high as either 0.70 or 0.79 (on model B) [Note that for those unfamiliar with Bayes, P(H/B) and P(~H/B) must always sum to 1, but P(E/H&B) and P(E/~H&B) do not have to sum to 1] P(H/E&B) = P(H/B) x P(E/H&B) / [P(H/B) x P(E/H&B)] + [P(~H/B) x P(E/~H&B)] Therefore, best case scenario for ~H: P(H/E&B) = 0.51 x 0.20 / (0.51 x 0.20) + (0.49 x 0.19) = 0.102 / 0.102 + 0.0931 = 0.102 / 0.1951 = 0.523 (rounding up) That would constitute mythicism being slightly more likely than historicism'. On this point – Archeologists could find a combined blast furnace / astrolabe with dual steam turbines and heat seeking crossbows which had originated in Medieval England and it still wouldn't have any bearing on the truth or falsity of Christianity as far as I can see. 6,000 mills divided among an estimated 1,400,000 comes out at 1 mill per every 233 persons. This isn't particularly unlikely given that many would have been pretty simple, consisting of a wheel laying horizontally in the water. This would have turned on a shaft fixed to a stone in the bed of a river. 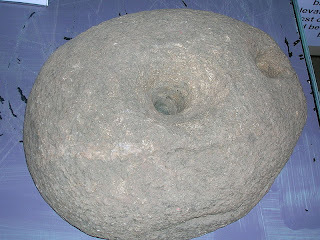 The upper end of the shaft would then have passed through the lower end of two quern like grinding stones and the mill wheel, the shaft and the upper stone turned together. The whole structure would have been extremely small and adapted for use on a minor stream or rivulet. Infantilise seems to be a mot de jour. In this yesterday’s Times, Libby Purves used this very word in an excellent article about whether unmarried couples living together should have legal rights. Due to the Times pay wall, you can’t read it online, but I left my copy on the 8:50 to Charing Cross yesterday and it is probably still there if anyone wants to grab it. The article followed an intervention by the president of the family division of the British courts, Sir Nicholas Wall, saying that when co-habitees break up, a judge should rule on how property is split between them. Now, my opinion of Sir Nicholas was already in the nuclear bunker below the basement due to his support for continued secrecy in the family courts and several dreadful decisions in adoption cases. I was pleased to note that former Justice Minister Jack Straw shared my opinion and tried, unsuccessfully, to block Sir Nicholas’s appointment to the presidency of the family division. Sir Nicholas now wants the law to decide what happens when unmarried couples split up. Family lawyers think this is a splendid idea but, of course, they will pick up fats fees as a result. This seems to me to be a classic case of the state sticking its nose in where it has no business. If unmarried couples want to come to a legal arrangement, that should be up to them. Presently, such an arrangement is available. It is called ‘marriage’ and is even available to gay couples (albeit under a different name). Where children are involved, it is quite right that the law steps in to protect their interests when their parents split up. But in the case where a couple move in together, as many do, and then split up a couple of years later without having any children, the arrangement should be private. Another layer of legal bureaucracy is the last thing we need. The difficulty raised by supporters of Sir Nicholas’s plan is the case of vulnerable women who are allegedly being thrown out onto the street when their lovers tire of them. They also note that people often don’t think through what they are doing. They might move in together, expecting that the arrangement will be for life and thus make no provision for if it doesn’t work out. The law, in other words, must protect people from themselves. But even if this really is happening, should a law be brought in that applies to all couples when they break up? Surely, as Libby Purves noted in her Times article, people must learn to take responsibility for themselves. A law such as that proposed by Sir Nicholas would further “infantilise” us, in Libby Purves’ words. Whatever the good intentions behind the suggestion, it would have insidious the consequence of making us less responsible for our own actions. Also, I fear that claiming women are not capable of taking that responsibility is chauvinistic. I am all in favour of ensuring people are aware that what happens when they split up is up to them. It might even be a good idea to make clear that the fabled concept of “common law marriage” does not actually exist. If you want to stay in your partner’s home when they die, you should get that in writing and into their will. And if you want a share of the house you are both living in, that should be documented too. The law should not, in my opinion, step in when people fail to take these elementary precautions. And just for the record, this is nothing to do with safeguarding the sanctity of marriage. This straw man is regularly erected by proponents of Sir Nicholas’s idea, but is the least of my problems with it. It is a bad idea in its own right and another fine example of how the road to a nanny state is paved with good intentions. 1. The universe began and it has a cause. 2. The universe didn't begin and it has a cause. 3. The universe began and it doesn't have a cause. 4. The universe didn't begin and it doesn't have a cause. In theistic religions, 1 has been the most common option. But it should be noted that there were still some who held 2, that the universe, despite not having a beginning, still has a cause (such as Aristotle, Averroes, and the Latin Averroists). There is a good reason for this: simply showing the universe had no beginning is not sufficient to show that it has no cause; many forms of the cosmological argument argue from the premise of an infinitely-old universe. Historically, the response of atheists was to accept 4, that the universe has neither a beginning nor a cause. Prior to the advent of Big Bang cosmology, position 3 was empty; at least I've never heard of anyone who accepted it, and the calls in the academic literature to find anyone who fits into it have gone unanswered. And yet it seems to be the position that atheists are driven to today. Of course, the fact that it has not been accepted historically does not mean that it is not a viable position to hold, but it surely gives us food for thought. Ultimately, the claims that the universe began or that it did not amount to scientific predictions. The claim that it did have a beginning has been empirically verified by contemporary cosmology, and the claim that it did not has been empirically disconfirmed. And historically, the first category consists solely of theists, while the second category consists mostly of nontheists with a few theists. However, while theists argued for the universe's beginning, they did not think refuting this would refute theism -- in other words, while their prediction that the universe began could be falsified, their theism could not be (at least not by this factor). Atheists, however, gave no such indication: if you refuted the universe's eternality, then you would refute atheism, since it was accepted by all parties that if the universe began, it must have a cause. So the atheists' prediction was falsifiable, and by the same lights, so was atheism. The problem, again, is that the atheists' prediction has been falsified. Thus, it would seem that atheism has been falsified. Yet atheists often claim to base their views on science and accuse theists of ignoring science. Surely this is backwards. Theists and atheists alike made a scientific prediction, the theists have had their prediction substantiated and the atheists have had their prediction refuted. In order to salvage their position, atheists have had to embrace a position that never occurred to anyone because it rejects the principle of causality. They have had to redefine their position so that it is no longer disproven by science. Again, this does not amount to a refutation of atheism, but if the tables were turned, do you think theists would be given the benefit of doubt? The problem was that under the autocrats – Nasser, Sadat, Mubarak and whomever Washington blesses next – the Egyptian people skipped two generations of maturity. For the first essential task of a dictator is to "infantilise" his people, to transform them into political six-year-olds, obedient to a patriarchal headmaster. They will be given fake newspapers, fake elections, fake ministers and lots of false promises. Fisk is right, of course. Which is not usually something you can say about him. When governments become all pervasive, citizens no longer have to take any sort of responsibility. In a dictatorship, everything is the leader's responsibility and he paints himself as the father of the country. People become like children. They can whinge, and frequently do, but if they misbehave they get smacked or worse. Sadly, though, almost all governments have this effect on people, even though, in a democracy, it is to a much lesser degree. The more government there is, the more people cease to take responsibility. When something goes wrong, we complain about our rulers but seem strangely unwilling to do things for ourselves. The present Conservative-led government is having trouble selling its idea for free-schools, localism and less bureaucracy for this very reason. It turns out that there are always plenty of people who have done very nicely attached to the teat of the state. Of course, it is widely accepted that governments infantilise their citizens, which is from where we get the phrase "the nanny state". But many of the left think this is a good thing. Alain de Botton, the pop-philosopher, defends a paternalistic state on the BBC's website. It all sounds terribly reasonable but what he is really saying is that we all need a bit of dictatorship to defend us from ourselves. I doubt Hosni Mubarak would disagree. UPDATE: My post above implies that Alain de Botton is arguing for dictatorship. Of course he isn't, and I'm sure he would not. The linked article is well worth a read and a rather more considered response than the one I gave it.